The chart yields an invalid ascendant at 2 degrees Gemini and also, a second red flag with Moon still in the via combusta, at 14 Scorpio. One of the greatest modern horary astrologers of our time is Diana Stone of Vancouver, WA, USA. She told me that the most relevant chart for employment is when you sail through the front doors of the workplace for your first paid shift. That is the point of no return, when the employer finally sees you in the office. Doing a chart for that moment can be revealing, Any other chart is just speculation, because you can still back out, isn't it true ? Posted: Wed Mar 07, 2018 3:28 am Post subject: Re: giggling at best..what else can I do? delete delete...sorry am confused about initial attempts at just what job she is vying for..hope you receive the work of your dreams. OK, So I have found out my starting time and date. So I cast this chart for that time, location and date. It doesn't look any better than my first chart to me. I see L10 exaults L1, which I would expect. They just hired me. However I see L1 in Fall of L10. I won't like the work? So I will leave this to your interpretation. I look forward to your mentorship once I get my feet under me. 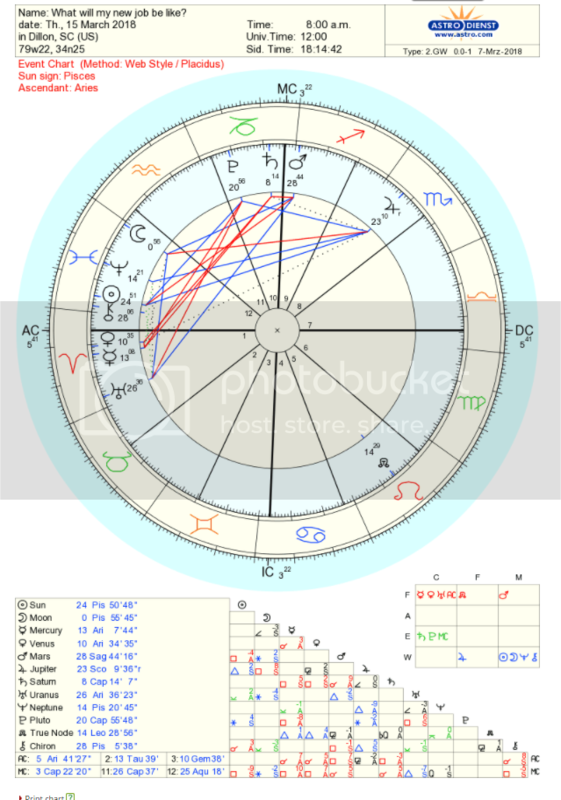 What is troublesome about this chart (an election chart, before the fact) is that the chart ruler, Mars in Sagittarius, squares or afflicts the radix Sun, found in the 12th house, and Moon is peregrine, also in the 12th house. As the 6th house of employment is ruled by the Sun, that would suggest a conflict with supervisors and or possibly, a co-worker. So, if you can, I would try to negotiate a different start time, or a different day to start. On the plus side, that chart features the ascendant degree 5 Aries and change, conjunct your natal Sun in Aries, so it's not all bad, but could be better ? Planning a proper start time is probably beyond the limitations of this forum. And so, you would need to consult a professional astrologer, in most cases, who had the time to do a proper election search ? Posted: Thu Mar 08, 2018 12:36 am Post subject: Re: Will I work here-New Job? Posted: Thu Mar 08, 2018 8:34 am Post subject: Re: Will I work here-New Job? even though I have not the least sympathy for your delivering natal dates by PM to a member of this forum, here some considerations as to your potential event chart. Your Moon in the twelfth is testifying some incertainty of your emotions as to the future in your new job, but not more, because the cold and wet Moon is in her element in the water trine, in pisces. So this position of you co-significator in the 12th must - and should - not be a testimonoy of self-undoing, but in fact of the possibiltiy of a strong awareneness of very fine athmospheric vibrations in the job and between you and the job. 2. to the job (Saturn) in its own domicile. This translation of light seems to be the chance of not only a very fine beginning, but for a very fine job too, if you take this chances the chart seems to offer. Provided, the natal is agreeing . . . see above. Do you think that the circumstances of your situation, feelings and the new job are paralleling my judgement above in any way, and if not, where are the differences? If you are going to publicly admonish Rookie, at least get your facts straight. For the record, Rookie, (by all accounts, an unemployed man looking for work) has never ONCE sent me his date of birth, etc. by pm or any other means. His birth data was posted on this thread and volunteered by him. If it no longer exists, that is his call, not yours. I will be more than happy to assist this gentleman, if he asks me. OK, So, I ignored the admonishment as an arrogant gesture and I am still not sure what rule, social or forum, that I broke. I doubt highly that anyone is going to gain influence over me knowing my birth data. Johannes, to your question regarding your reading. I have some concerns regarding the position I am entering that center around work life balance and how I can be a better leader in this position. So yes I think your reading is spot on and I am happy to read that you see the position fitting me. I was not aware that you had posted your nativity and has deleted it in the meantime. As another member referred to your Sun of birth or radical Sun I thought that you had sent your nativity data to him by PM. This is often happening on forums and also on Skyscript to the best of my rememberance. Only this had been a nuisance in my opinion. So I aplogise. And please let me assure you of the fact, that it is and has not been my intention to dispose you in any way to publish your birth data. All my best wishes for your start and success, Rookie!